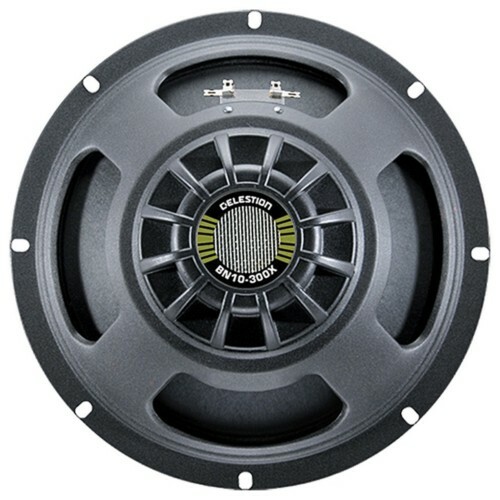 Celestion use the highest grade materials and components and make some of the finest bass speakers available. The Daddy of all bass guitar speakers is the Neodymium 10 Inch BN10-300X Green label bass speaker. This speaker gives not only 300 watts RMS power handling but is superlight due to its Neodymium magnet. The speaker has with the same classic rounded rock sound with the tight low end definition that is associated with Celestion drivers, with a more modern edge. The Celestion BN10-300X speakers feature enhanced mid-range punch to cut through the mix while delivering solid lows. The cone material is Kevlar impregnated which gives a warm smooth even response. The Neodymium magnet gives the fastest cone response with a quicker more dynamic attack it also has a cleaner upper mid and top end response when compared to the BL10 or other traditional ferrite magnet speaker. This speaker is ideal for those rock players who want a bit more top end detail with a crisper bass but retains the traditional warm rock sound. It works well for funk players who like to slap and pull and does not sound over bright even when using an active bass. In your 4 x 10 then this unit will give your cab a little more sparkle. If like me, you will appreciate the weight saving in your 4 x 10 cab as at 2 am in the morning after your gig loading your cab in your car the benefits are, 4 Celestion 300X Neo weigh 14lbs, so 1 stone, 4 ferrite 10inch bass drivers weigh 45lbs so 3.2 stone, it’s a real not brainer and with these your 4 x 10 will handle 1200 watts RMS. Hey now you can run any amp into your cab.